The purpose of My Big Tomorrow is to improve the literacy and numeracy skills of 15 and 16 year old Australian high school students from low socio-economic backgrounds. The ultimate goal is to help them graduate from University. The initiative is sponsored by the Centre of Excellence for Equity in Higher Education at the University of Newcastle, Australia. After extensive consultation with high school students, we determined that there was a lack of useful resources available to help them understand career choices. This is a problem Australia-wide. My Big Tomorrow was created to fill that void with inspiration, information and education. It is also designed to give them an understanding of the skills they will need in order to succeed in their chosen career. Before we lifted a sharpie we interviewed students and teachers, and we didn’t stop interviewing and testing until we got it right. We designed the ‘discover a career’ matching tool around the things 15 and 16 year olds really care about, like being part of a team, music and helping others. We made sure the type-ahead search had the right synonym hinting so “guitar”, “dogs” and “football” would return relevant results. This is the Google generation and our search synonyms are based on user research. We added just enough interactivity and user feedback to the tactile buttons and interface elements. We know our audience loves StumbleUpon and we made stumbling a popular website feature – the website’s averaging over 300 ‘stumbles’, or ‘Career-a-majig’ presses, per day. 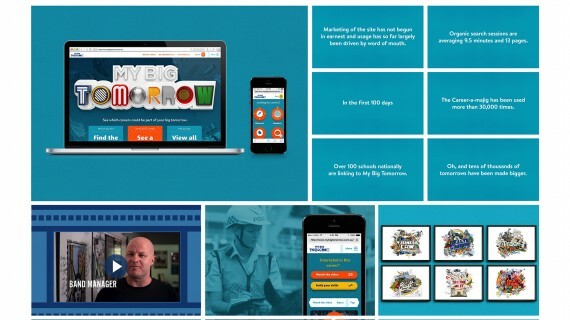 After almost 100 days live, My Big Tomorrow has shown impressive usage nation-wide by a hard-to-impress audience. The primary goal is to improve literacy and numeracy skills of high school students from low socio-economic backgrounds. The secondary long-term goal is to help them graduate from University. An education issue we’re helping to solve is students from low socio-economic backgrounds typically find University more challenging than the average student and have higher University drop-out rates. Our research confirmed how important ‘day in the life’ films are for inspiring students and creating a compelling user experience. The website features 93 careers and we wanted to create ‘day in the life’ films for all of them. The budget didn’t allow for this, so instead we searched and discovered an ABC resource of completed career films. We successfully negotiated a license to 86 films on behalf of our client. We “topped and tailed” these films to help them fit with My Big Tomorrow. We created 7 of our own, resulting in every career having an inspiring ‘day in the life’ film to better connect with students. In reality, licensing existing films gave our client the equivalent of $1m in additional budget.